What shall we say the kingdom of God is like, or what parable shall we use to describe it? It is like a mustard seed, which is the smallest seed you plant in the ground. Yet when planted, it grows and becomes the largest of all garden plants, with such big branches that the birds of the air can perch in its shade (Mark 4.30-32 NIV). This illustration described the growth and expansion of God’s kingdom on earth, i.e., growth of the Christian Church. Although the Church began in a small province of the Roman Empire, it grew larger than the mightiest empire on earth. Another time Jesus used the mustard seed in an illustration, he was in Caesarea Philippi. Jesus wasn’t with disciples when a man asked them to heal his son, possessed by a demon. Disciples were unable to heal the son. Jesus arrived and ordered the demon to leave the boy (Matthew 17.14-21). After Jesus expelled the demon, disciples asked him why they couldn’t heal the man’s son. Jesus responded that they had too little faith. He told them that if they had faith the size of a mustard seed, they could say to a mountain, “Move from here to there” and the mountain would move (Matthew 17.21 ESV). Jesus’s point was that nothing is impossible with sufficient faith, even when that amount of faith is as small as a tiny mustard seed. 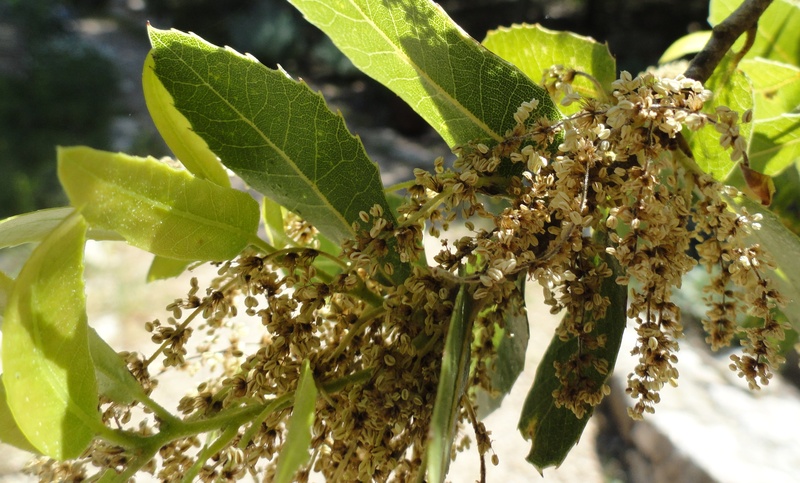 In scientific communities, the mustard tree is the Salvadora perisica, commonly called the toothbrush tree.6 Indigenous to Persia (Iran), the mustard tree could have been brought into Palestine by traders. Alternatively, returned Jewish exiles may have brought mustard tree seeds from Persia and planted them in gardens and fields. The mustard seed grows best in hot, arid climates; high humidity stunts tree growth. The mustard tree is an evergreen that can grow to twenty feet. Often, mustard trees have many branches that start to grow from the tree trunk low to the ground. The mustard tree can grow as wide as tall. Mustard trees reach full size in a few years. Like branches of a mustard tree, Christianity spread throughout the Roman Empire and into India and Ethiopia. In a few centuries, Christianity went from unheard of, to being outlawed, to the official religion of an empire. Mustard trees were used for shade because of their low-growing branches. Similarly, people from all nations took refuge under the canopy of Christianity. Unlike thorn trees (Ziziphus spina-christi), mustard trees have no thorns to deter individuals from resting beneath them. Although wild animals sometimes fed on tree shoots, many branches grew high enough that predators couldn’t reach birds that nested in them. In Jesus’s teaching about the mustard tree, birds settled in its branches. Some Bible commentators interpreted this clause as a warning to keep the early Christian church pure. In Old Testament scriptures, the phrase “birds of the air” was sometimes used to symbolize demonic forces. From this perspective, Jesus warned disciples to beware that Satan would attempt to encroach on the kingdom of God. Certainly, Jesus warning became reality. In the first few centuries of the Christian church, Jews (Judaizers) advocated that newly converted Christian could be justified only by observing Jewish laws, i.e., circumcision, adherence to Jewish dietary laws. The Gnostics claimed they possessed elevated knowledge, a “higher truth.” The higher knowledge was acquired, not from the Bible or apostles’ teachings, but, from a higher mystical plain of existence. Individual with this special knowledge, for example, Jezebel in the Thyatiran church, believed they were elevated above other Christians because of their deeper knowledge (Revelation 2.18-25). At times, Bible scholars concluded that the black mustard (Brassica nigra) plant was the source of the mustard seed that Jesus referred to in teachings that used the mustard seed. Very likely, the true mustard tree was the Salvadora perisica. Many powerful men attempted to stop the spread of “The Way,” the early name for the Christian church. The Jerusalem Jewish leadership tried to stop it when they arrested Jesus and turned him over to Pilate for crucifixion. King Herod attempted to stifle apostle’s teachings when he killed the apostle James and had Peter arrested. Paul was beaten, confined to house arrest, jailed, and finally murdered; however, Paul’s letters, many written while he was confined or jailed, were important to the spread of the good news of Jesus in the Gentile world. Despite many deterrents, the fledgling Christian church grew in numbers. Through Paul, Peter, and John’s letters, converts deepened their understanding of Jesus as Son of God. They came to understand the role of the Holy Spirit in individual lives and in the church. Jesus’s mustard seed illustration came true in early centuries after his death and remains true today. Even with anti-Christian rhetoric and entire denominations turning from God’s commands, continuance—even extension—of the church Jesus founded is inevitable. Important for westernized societies is the answer to the question, “Where will Christianity spread next and/or grow even deeper roots?” Will it be in Greece, Rome, or Asia Minor where Christianity was first embraced? Perhaps, Germany and Great Britain, homes to great reformation thought? What about the United States, founded on principles of religious liberty? We need to pray that individuals in all nations experience Christian revival, so they can rest in the shade of God’s love. Reflection: Will Christianity grow in your sphere of influence? Do you Want a Long Life? When Abraham was about 75 years old, God directed him to leave his home in Haran. Abraham traveled with his wife Sarah, nephew Lot, and servants to Canaan. Later, Lot separated from Abraham. Abraham moved his tents to the great trees of Mamre near Hebron where he remained many years. When Abraham was 99 years old, he had three visitors; one was the Lord. The Lord revealed two things to Abraham. First, Sarah would give birth to Abraham’s son within the next year (Genesis 18:10). Second, the Lord planned to destroy the cities of Sodom and Gomorrah because of their extreme wickedness. Abraham’s nephew Lot and his family lived in Sodom. Abraham was able to negotiate with God so that if as few as 10 righteous persons lived in Sodom, the city would be spared. The next morning Abraham went to a place that overlooked the plain cities of Sodom and Gomorrah. Abraham saw dense smoke rising from the plain. God was unable to find 10 righteous individuals in Sodom. Shortly thereafter, Abraham left Mamre and traveled into the Negev region where Isaac was born. At some point after Isaac’s birth, Abraham returned to the area of Mamre near Hebron. The great trees of Mamre are Quercus calliprinos, called Palestinian oaks. Some Bibles translate oak as terebinth; however, the oak and terebinth are different trees. The Palestinian oak originated in the Mediterranean Basin. It is the most common tree found in the wildlife of Israel. Fine specimens grow the Biblical Landscape Reserve in Israel. Palistinian oaks propagate by producing acorns. Ripe acorns drop from trees and germinate in 1 week. Seedlings grow slowly. At one time the Palestinian oak was an important source of hard wood for ships, ploughs, yokes, canes. Bark was a source of tannin to dye skins and leather. Acorns were roasted and eaten during famine. The tribe of Dan made way-bread from acorns and took it to war. In the Bible, oaks were associated with power, strength, or longevity in the sense of long life. The great oaks of Mamre symbolized Abraham’s long life. 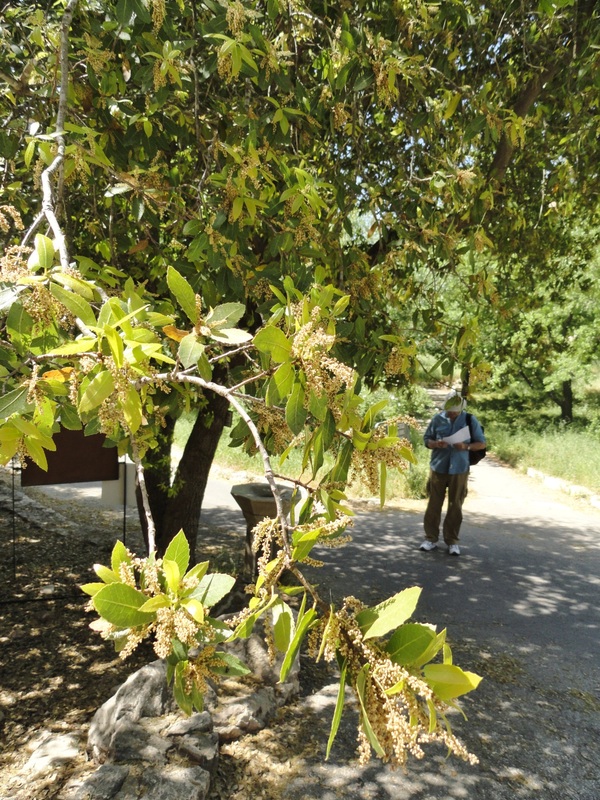 A Palestinian oak near Hebron, called Abraham’s Oak, is thought to be over 850 years old. God promised that he will be with his servants through life, even into their old age and gray hairs (Isaiah 46:4). God’s people don’t need to be concerned about aging, or what they will do in retirement. They can use Abraham as their model. God called Abraham to a new life and adventure when Abraham was 75 years old. Abraham lived 175 years. Following Noah’s death, the Bible documented that after the flood, only Isaac lived as long as Abraham. An Israelite proverb is that the fear of the Lord adds length to life; but the years of the wicked are cut short (Proverbs 10:27). Perhaps the underlying logic of this proverb is as simple as individuals who fear the Lord live more prudent lives than do the wicked; therefore, they live longer. Whatever the cause and effect of the proverb, it is important and true because it is God’s word. Reflection. Do you want a long life? How do you think a long life is related to fear of the Lord? Does fear of God have any place in how you live your current life? Copyright: February 22, 2015; Carolyn A. Roth; All rights reserved.